Polenta is a creamy cornmeal porridge, one of those comfort foods that will warm you up on a cool, dreary day. Polenta is super versatile, so much so that you can finish it on the grill to bump it up a notch and give it a wonderfully crispy exterior while the interior remains creamy and buttery. It is this contrast that makes it so heavenly. Making grilled polenta is easy, too. You make a batch of creamy polenta and let it set in a loaf pan, then slice it, and grill the slices. Also, you can grill your polenta in a cast-iron grill pan or on a gas grill, either way, you can get characteristic grill marks. You can also grill it on an ordinary cast-iron skillet, which will produce a uniform golden brown crust on the polenta slices (although, no grill marks). If you have leftover polenta, then grilling it is a good way to go. Refrigerate it within a few hours of cooking and it should keep for five to seven days. Prepare one batch of creamy polenta. Pour warm polenta into a glass loaf pan. Smooth the top, cover and refrigerate until set, a few hours or overnight. Turn the polenta onto a cutting board. It should be completely molded into the shape of your loaf pan. Cut into 1/2-inch slices and brush each one with olive oil on both sides. If using a gas grill, a medium-high setting should be enough. Place each slice diagonally across the grill and let it cook for about 10 minutes or until dark-brown grill marks appear. Don't move the polenta around, though, or you will disturb the browning process. Flip and grill the other side until grill marks appear, about another 10 minutes. Serve hot. 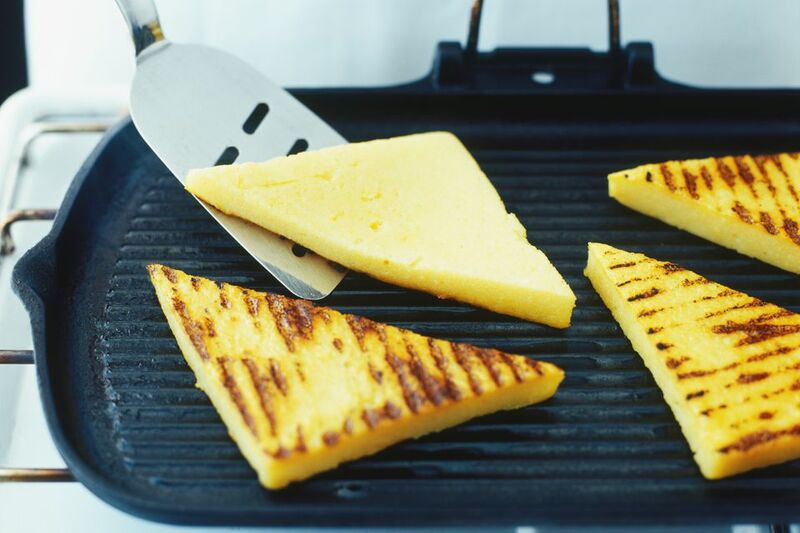 Prepare it on a grill pan or skillet: If you plan to use a grill pan or skillet, lightly oil your pan, press the polenta into the pan with a spatula, and bring it up to heat until it is quite hot. As the polenta softens, you can press it down further. The more of it that is in contact with the surface of the pan, the more crispy and golden-brown it will become. Do not overcrowd the pan. Work in batches if necessary. Sheet pan method: Instead of shaping your polenta in a loaf pan, you could spread your cooked polenta onto a sheet pan lined with parchment paper about 1/2 inch in thickness. Once it is cooled, cut it, and grill it. The sheet pan method is a bit quicker since it takes less time to cool when it is spread out. And once spread it out, you can cut your polenta into rounds, triangles, or whatever shape you prefer.